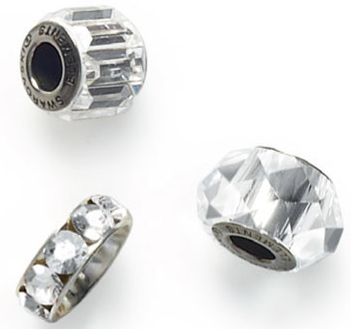 With environmental change and the mega-trend of neo-ecology increasingly in the limelight, SWAROVSKI ELEMENTS Pre-Launch innovations are a timely reminder of the strength and fragility of nature and a tangible, radiant reminder of our role as her guardian. 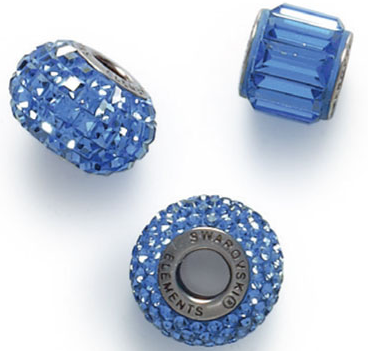 The new Swarovski color of Crystal-Montana Blend is a gorgeous two-toned color that combines the Dark Sapphire/ Morion type of blue infused with a light grey hue that is representative of the plunging depths of deep Montana blue merged with the pure diamond like of clear crystal to create a blend reminiscent of glacial mountain ranges. Inspired by the natural elements of melting snowcaps and frozen lakes is brought together in the icy radiance of this crystal, evoking a winter wonderland frozen in time. 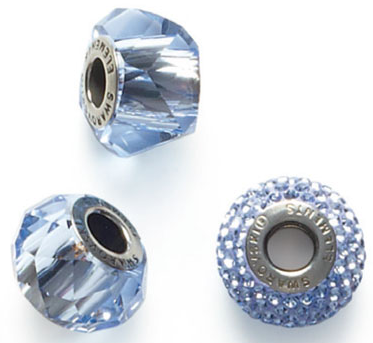 The Crystal-Montana Blend from SWAROVSKI ELEMENTS is available in the 5328 3mm, 4mm, 5mm, 6mm and 8mm Xilion Bicones as well as the 5000 Round Beads in 4mm, 6mm and 8mm along with a variety of Pendants and Sew-on Stones. 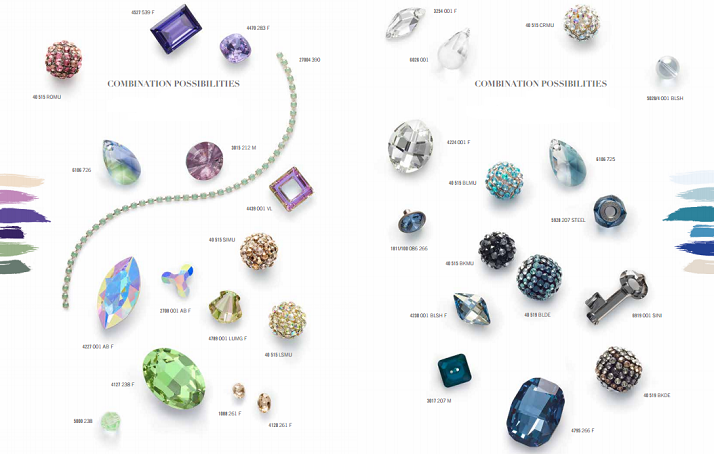 Historical records of travelers' discoveries point to birthstones first being worn as personal ornamentation in India. Over time, certain stones came to be associated with the twelve signs of the zodiac and the twelve months of the year, and by the 15th century, wearing the gem appropriate to one's birthday was believed to give special powers. 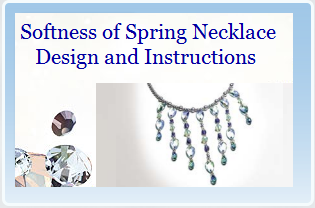 Over time, certain stones came to be associated with the twelve signs of the zodiac and the twelve months of the year, and by the 15th century, wearing the gem appropriate to one's birthday was believed to give special powers. 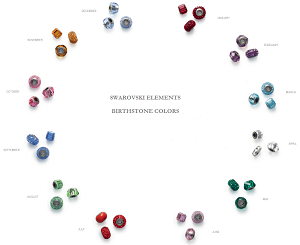 Today, we are still drawn to their mythology and poetry, and it is these qualities that have been captured in the interplay of light from the BeCharmed collection’s myriad facets of twelve colors and effects, each of which is designed to harmonize with the colors of the different birthstones. 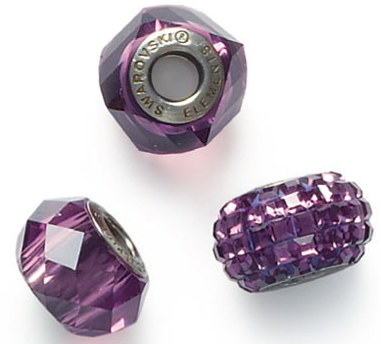 There are a myriad of colors and coatings that will complement the feminine and subtle Provence Lavender-Chrysolite Blend with other SWAROVSKI ELEMENTS. 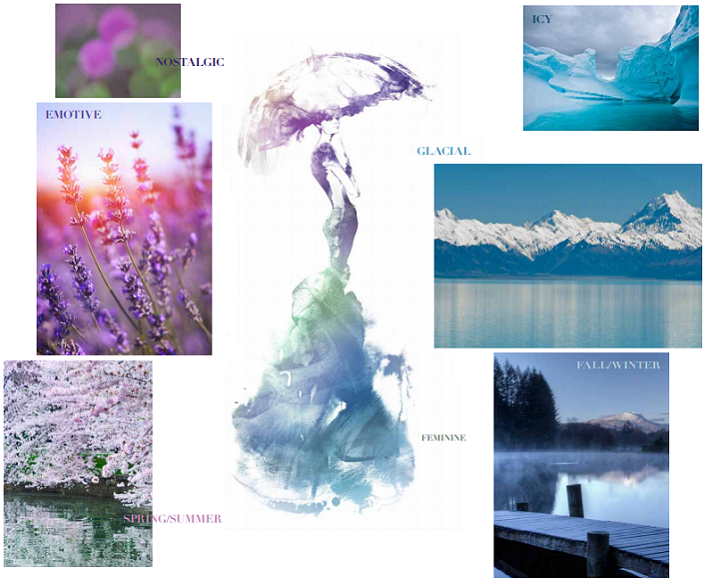 The deeper bluish purple tones of Tanzanite, Tanzanite Satin, or Tanzanite Cal blends well with the lighter pastel hues of Light Amethyst, Violet, Violet Opal, Violet Opal Satin, Crystal Vitrail Light and Crystal Purple Haze. 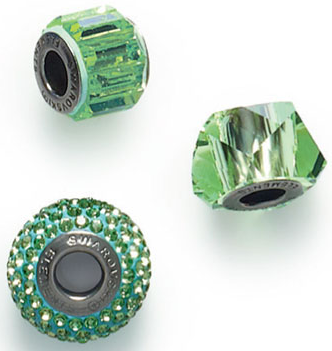 The soft verdant shades of Chrysolite fuse well with Chrysolite Opal or Crystal Luminous Green as well as the richer tones of Peridot and Peridot AB and Peridot Champagne, Peritod Satin and Peridot Dorado. 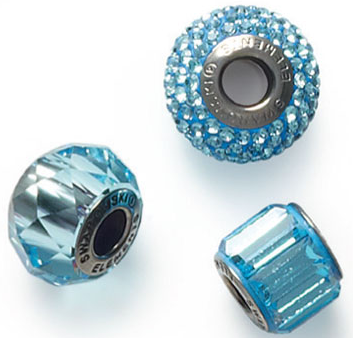 The color as well as crystal coating combinations are endless and the desired look is up to you, let your inspiration be your guide! 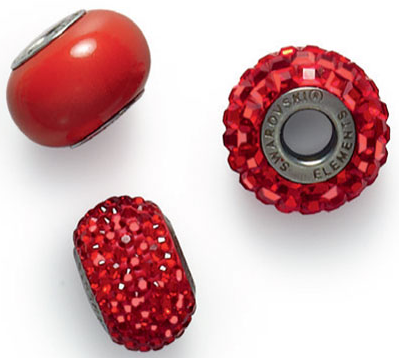 Siam is the January birthstone color that is deep red color traditionally used as a Christmas Color Red or the red similarly found in the American flag. Amethyst is the February birthstone color and is a medium to rich medium to dark reddish purple tone and blends nicely with Lilac and Light Amethyst. 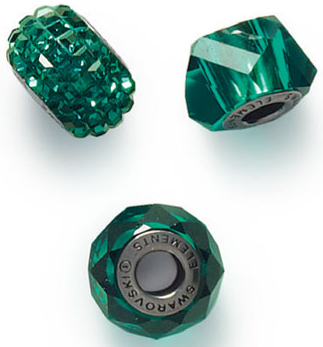 Emerald is the May birthstone color which is a classic medium to dark green tone that is one of the most popular greens available and is celebrated as the traditional Christmas green. 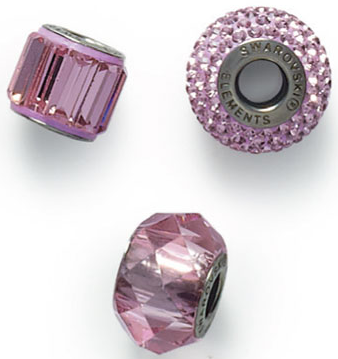 Light Amethyst is the June birthstone color and is a light pastel purple that is a perfect transitional color that blends beautifully with both the pink and purple tones. 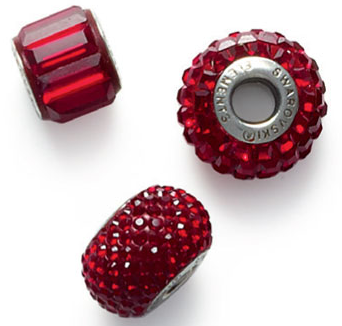 Light Siam is the July birthstone color and is a very popular bright red cherry color that is especially fashionable for Christmas jewelry which really pop against the deeper tones of Siam. Ruby can also be used as the July birthstone color and is a beautiful gem tone type of tone that is a deep and rich red color infused with highlights of pink that soften it to almost a brighter berry color, mixing well with Fuchsia and Burgundy. Peridot is the August birthstone color, a vibrant green tone that is one of the most popular green colors available and is lighter than Emerald and darker than Chrysolite. 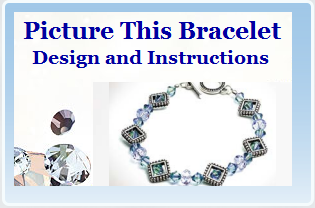 Sapphire is the September birthstone color and is a traditional medium blue tone resembling the vibrant depths of the ocean and is the standard blue represented in the American flag. 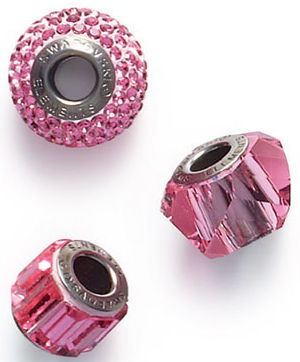 Rose is the October birthstone color, a deep and vibrant traditional pink color which is a symbol of grace and elegance. 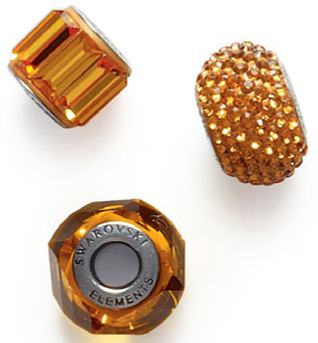 Topaz is the November birthstone color and is an amber color, almost a burnt orange, which is perfect fall hue that blends well with brown toned family colors cuch as Crystal Copper, Crystal Chili Pepper, Crystal Golden Shadow and Smoked Topaz to name a few. 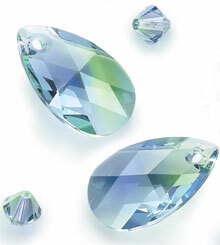 Light Sapphire is the December birthstone color which is softer version of the traditional Sapphire color, reflecting a baby blue quality it also harmonizes well with Air Blue Opal. 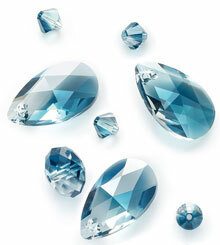 Blue Zircon can also be used for the December birthstone color representing a vibrant medium toned blue with hints of green to create a sparkling fusion of bluish-green tones.